Happy Mardi Gras! 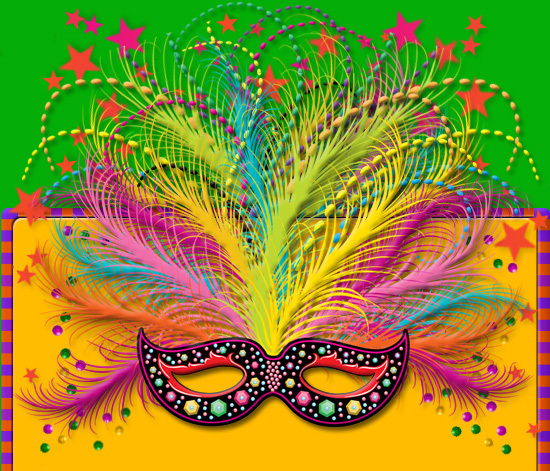 Holidays on the Net is delighted to invite you to our bash in honor of Fat Tuesday. Celebrated throughout the Gulf Coast, Mardi Gras is practically synonymous with New Orleans. But you don’t have to live in Creole Country to enjoy a good party. In fact, if you want to get in on the fun, just come join us for our Mardi Gras Ball! Learn all about the history of Mardi Gras, AKA Fat Tuesday (including just what’s so “fat” about this mid-winter Tuesday). Discover the magic of a Mardi Gras parade and investigate their myriad traditions, like throwing beads, doubloons and trinkets. Try out our recipe for the traditional King Cake, or make some of your own party goodies — maybe even your very own parade float! The history of “Fat Tuesday”. Another look at Mardi Gras. The official colors for Mardi Gras are purple, green, and gold. What’s a holiday without the Parade? Beads, Doubloons, and Trinkets. Oh My! Yum Yum! And the recipe too! Easily print out these holiday related coloring pictures. All you’ll need to bring are the crayons. Mardi Gras King Cake recipes from our Holiday Recipe site – Holiday Eats – to help make your holiday a fun and tasty one! Get a taste of the festivities with these videos from some of the many Mardi Gras parades. Haydel's Bakery Roman Candy Wagon With Horse King Cake Baby Impossible 1990 S? 1975 Mardi Gras Ball Krewe Favor Kofh Ice Scoop Pewter 3 1/2"x2"